Ol' Backwoods has been working on Project Appleseed targets at the range all summer. 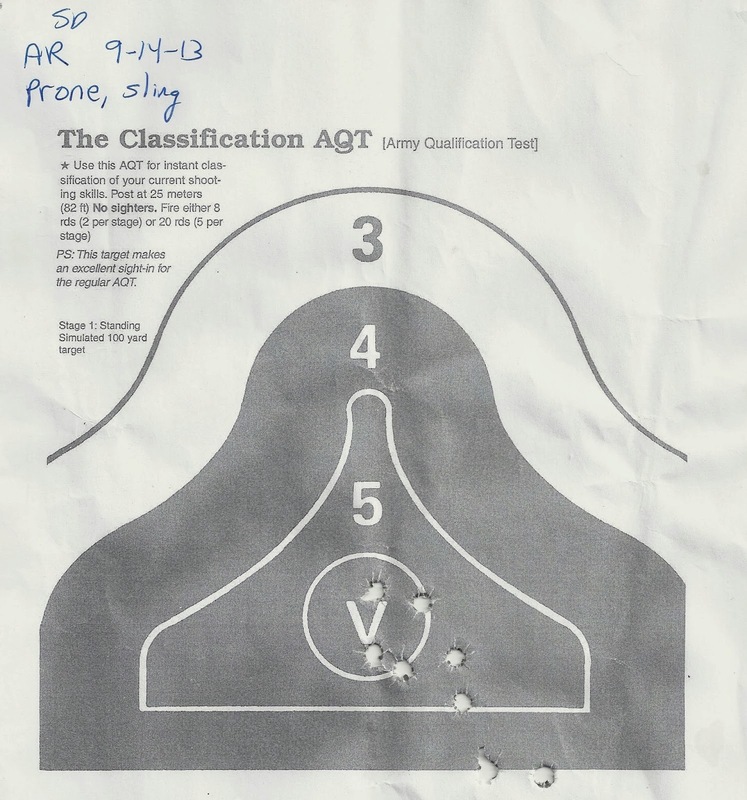 For those that don't know, Project Appleseed is the rifle marksmanship training course put on by the Revolutionary War Veterans' Association (a humorous but endearing title), in which a variant of the old Army AQT (Army Qualification Test) timed marksmanship test is taught. The practice target is is a PDF file linked here. 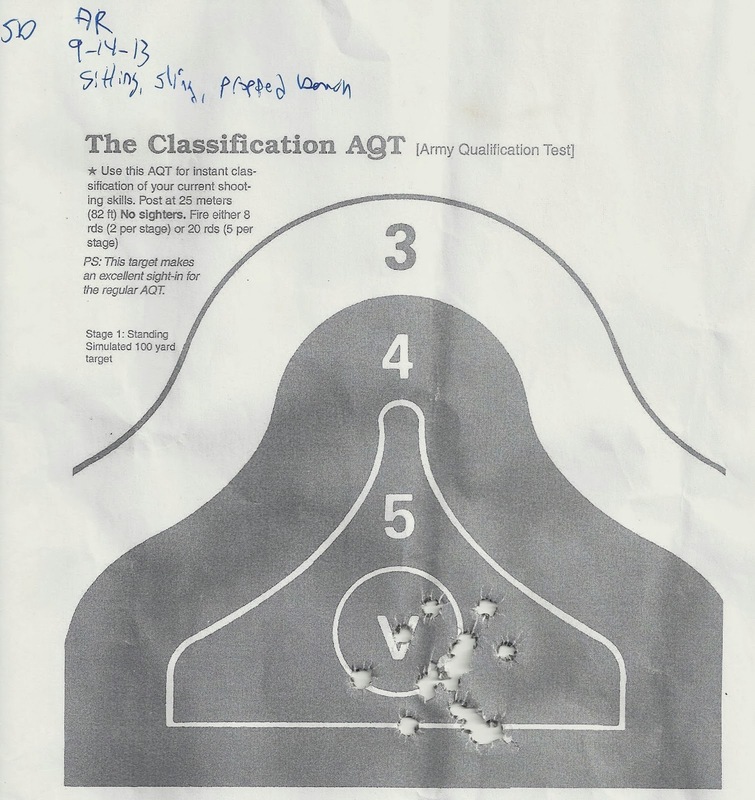 It is posted at 25 meters (82 feet), and is shot standing, sitting, and prone. In the Project Appleseed course, they teach the "tight sling" method of holding the rifle steady. The target simulates a man at 100 yards away. Below are a couple of Ol' Backwoods' targets from the last range session. I am getting better, but my standing scores are still too low. I have a lot of work to do there. I shot both of these targets with one of my AR-15's that a built, my favorite one that has a custom gas-block-mounted quick-disconnect sling mount that I machined. (I need to do a post about that.) I use a red-dot reflex sight from Burris (the FastFire II) as my sight. I love a red-dot sight for the fast acquisition it provides, and the ability to keep both eyes open. As you can see, sitting is my best position; somehow, it is easier for me to get into my Natural Point of Aim (NPOA) in that position. NPOA is a concept taught in Appleseed whereby the body and rifle are locked into a unit and pointed directly at the target, with aim being held by the large muscle groups. This minimizes change in aim from shot to shot. Also emphasized in the training is the cadence of shooting timed by one's breathing. It's amazing how much your point of aim shifts because of your breathing; it's best for your NPOA to be set when your lungs are nearly empty, so that you press the trigger in the middle of an exhale. I don't love getting down on the ground at my age, but I do love shooting rifles, and I have a lot of respect for the concepts taught in the Appleseed course. They make me a better hunter, and better able to defend my home and community from tyranny.